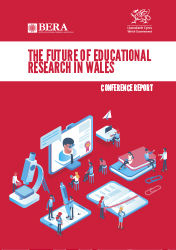 This report, published by BERA in partnership with the Welsh Government, presents the proceedings of and lessons from the Future of Educational Research in Wales conference. Held in Cardiff on 14 November 2018, this hugely successful event provided a platform for teachers, researchers and educational stakeholders in Wales to share ideas about opportunities for research and evidence-informed practice as the education system in Wales undergoes an ambitious programme of reform. The report, published in both English and Welsh, summarises the day’s presentations and discussions about the state of educational research in Wales; how evidence can shape classroom practice; and how constructive partnerships can be developed across the sector. It features contributions from Kirsty Williams AM, Minister for Education in the Welsh Government, Philippa Cordingley, Professor John Gardner, Professor David James and many other leading thinkers on education in Wales. Also included is a statistical analysis of responses to key questions facing the education sector, submitted and discussed during an interactive session, which gives some clear indications of attendees’ most pressing and prevalent priorities for the future (see the separate download – Appendix 2, in English and Welsh – for attendees’ account of the wealth of educational research underway in Wales). By distilling and documenting the ideas and opinions of speakers and attendees, the report presents an account of the past, present and future of educational research and research-informed practice in Wales. A full suite of other resources arising from the conference, including full audio of the day’s events, key presentations in Welsh and English and an online poster exhibition, is also available – see below for details. BERA and the Welsh Government extend their deepest thanks to all speakers, delegates and poster presenters for their valuable contributions to this event and, through it, to the future of educational research in Wales.